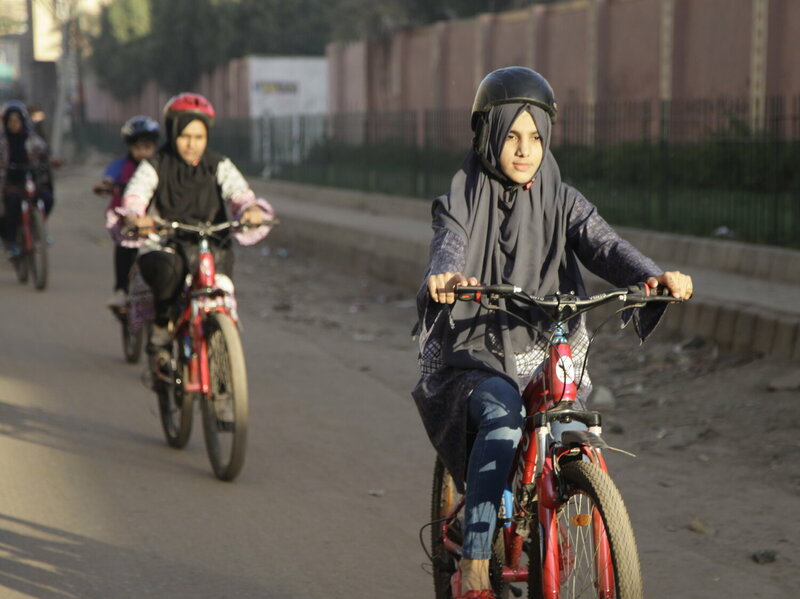 Women are discouraged to bicycle in Pakistan, where it is viewed as a threat to public morality. A woman straddling a bicycle seat can be seen as vulgar, and women riding around in a public space for purpose (other than enjoying bicycling) is considered a public act. Still, this group of working-class women continues to ride because "Regardless of where a woman lives, she has a right to move freely," organizer Zulekha Dawood says, "This is empowerment. We feel good. We feel free. We can go anywhere. Some aspects of riding are certainly universal! Read the full story here. Ayesha McGowan works tirelessly towards her goal of becoming the first African-American female pro road cyclist, ever. Along the way she uses her platform to encourage other women to ride with her in her "Do Better Together" virtual ride series, answer the question of how to get more women into cycling by inviting women of color to tell their cycling stories in her podcast Quick Brown Foxes, and teaching basic bike maintenance skills on her YouTube channel AQBF. Any list of inspiring stories of women in bicycling should include Ayesha for her dedication to always #showingup and reminding us that #representationmatters. Visit Ayesha's website www.aquickbrownfox.com to learn more about all her projects. Leah co-founded World Bicycle Relief in 2005 in response to the Indian Ocean tsunami the year prior. Since then, World Bicycle Relief has grown into an organization that mobilizes people through The Power of Bicycles. Leah envisions a world where distance is no longer a barrier to independence and livelihood, and utilizes her background as a documentary photographer to tell the compelling stories of the people WBR is working with. Note: Po Campo has been a proud partner of World Bicycle Relief for many years, in which we donate a bicycle to the program for every 50 bags we sell on pocampo.com Ready more about Po Campo's partnership with World Bicycle Relief. Kalala began riding her bicycle around Newark, NJ as a way of meditation and to discover her surroundings. A happenstance comment from a man on the stree about how she should continue to ride because he didn't see too many girls biking made her wonder, "What if I can get more girls to ride bikes?". With that, she created Girls on Bikes, a community organization whose mission is to encourage girls in urban communities to participate in recreational activities in the public – in style of course. Read this article on Kalala and Girls on Bikes in The New York Times and follow @girlsonbikess on Instagram. CycloFemme is a global celebration of women created to honor the past, to celebrate the present, and to empower the future of women everywhere. Each year on Mother’s Day (Sunday May 12, 2019), self-led bike rides around the globe unite riders, regardless of gender, age, ethnicity or bicycle preference. Any ride length, type, and size counts, whether two friends, a team or a parade. Cyclofemme was created by Sarai Snyder and Language Dept (Tanya Quick and Jenn Cash), but they're quick to say that it is a movement powered by YOU (and US). Learn more about Cyclofemme on their website.